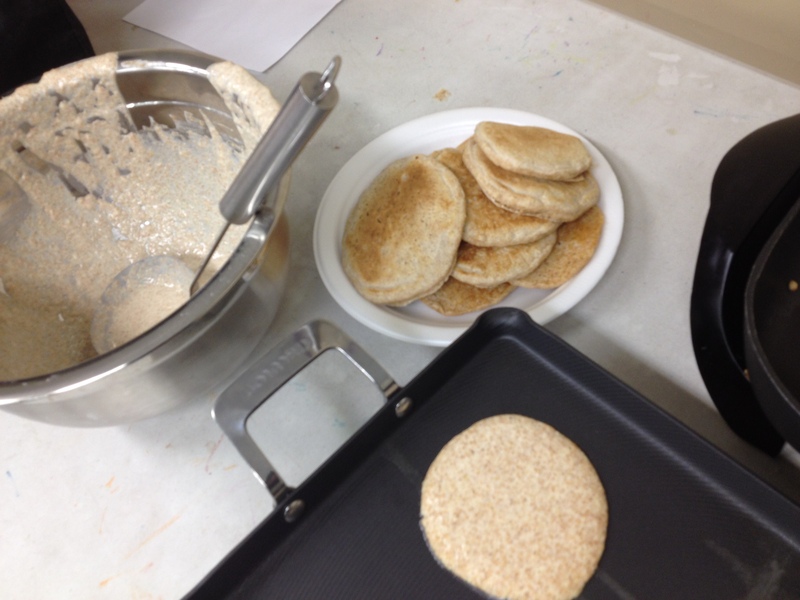 In the spirit of celebrating Pancake Tuesday recently in February, I decided to make pancakes in my Mini Chefs class at Trico Center. Pancake Tuesday is a holiday I love, also called Fat Tuesday or Mardi Gras, it is the day before the beginning of Lent, and in the times of no refrigerator, it was a time to eat up all the foods that were considered fatty, would go bad and that people would ‘give up’ during the Lenten season. Besides what child does not love pancakes? I do not know many, so I knew that they would be a hit with all my kids, even some of my more particular eaters. I decided to go with a basic plain pancake recipe, as I feel this should be a staple in every home, plus it is easy to ‘dress up’ in a variety of different ways. Of course, there is the traditional maple syrup and butter, but you can also have fruit toppings, ice cream and whip cream to name a few options. 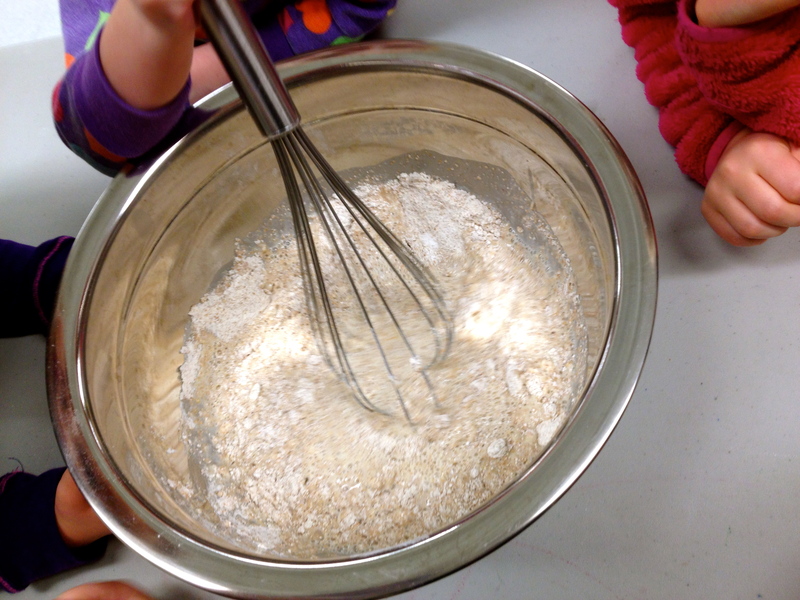 Plain pancakes are also really easy to make with kids, as there is a lot of measuring, scooping and mixing involved. It actually takes longer to cook the pancakes than it does to make the batter! I had each of the kids take a turn measuring an ingredient and dumping it into the bowl. Then a few of them had a turn mixing it up, which honestly this job is easily done by one person, but I find the kids really love to mix stuff. I could easily occupy them all day with mixing (parents something to think about lol). The kids were also very interested in watching the pancakes cook. I had them all stand at a safe distance from the pan and they watched as I poured the batter in and then waited for them to cook. For those that were interested, I pointed out the bubbles that were forming on top and that when they had lots of bubbles it meant it was time to flip them over. One little girl thought this was fascinating. Once we had all the pancakes cooked we sat down to enjoy them! 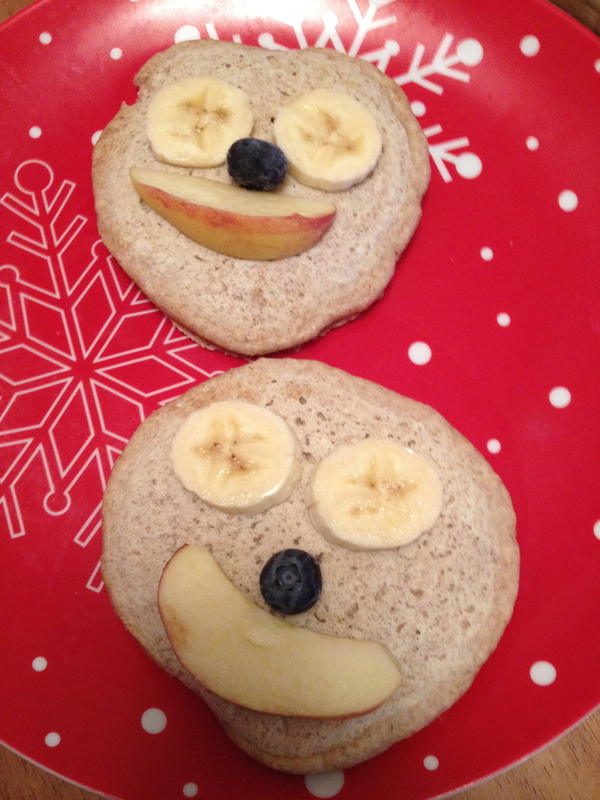 I had cut up fruit in advance, bananas, apples and strawberries and told them were we going to make faces on our pancakes with our fruit. Chloe who had done this before at our house, demonstrated what to do and then picked up her pancake and started eating. I was surprised to see all the other kids follow suit, with not a single one asking where the maple syrup was – which I actually did have to go with our pancakes that day. 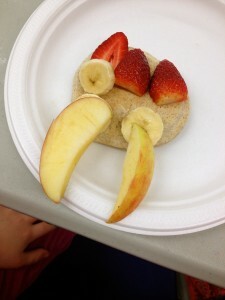 But since they did not ask for it, I just tucked it away and let them enjoy the pancakes and fruit faces they made. It was pretty easy and it was super fun. 2 ¼ c. non-dairy milk of choice – almond milk, coconut milk, etc. Mix together all ingredients in a bowl. 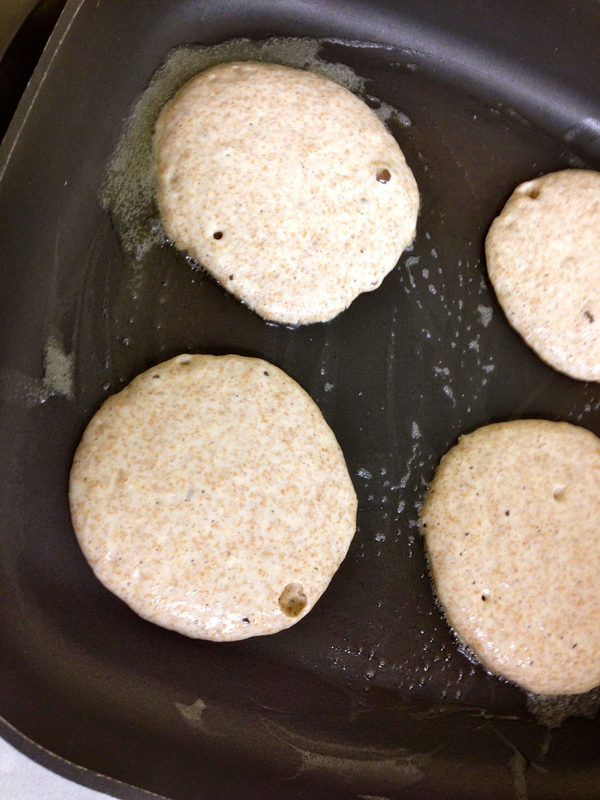 Pour ¼ c. batter on hot griddle. When bubbles form on top, flip pancakes over. Cook for another 3 minutes. Top with favorite fruit or enjoy with pure maple syrup. Coming up next in Kids Healthy Cooking Mini Pizzas! This entry was posted in Activities for Kids, Breakfast, Dairy Free, Kids Healthy Cooking, Recipes, Sugar Free and tagged cooking with kids, dairy free, Fat Tuesday, fun with pancakes, Lent, Mardi Gras, Pancake Tuesday, plain pancake recipe, pure maple syrup, sugar free by Carmen. Bookmark the permalink.